Calling all jet ski fanatics! There’s great news here at Roosevelt Lake Marina for those of you who have been asking about jet ski rentals. The Marina has partnered with Arizona Stay and Play to provide lake lovers with access to jet ski rentals (and more!). If you’re not familiar with Arizona Stay and Play, they help people wanting to enjoy the amazing lake with options for both home rentals and also jet ski rentals. That means that now in addition to renting of boats, kayaks, paddle boards and water toys you can rent from the marina, you can also rent some jet skis for your day (or weekend) on the lake. 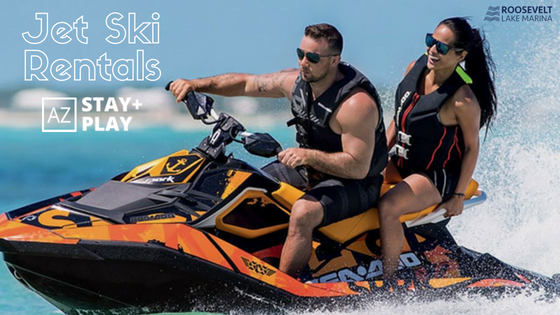 So when you’re ready to get your jet-ski on, reach out to our partners over at AZ Stay and Play and rent your jet ski today!